What Do You Need to Know About A Roll-Off Container in Fallston? That’s where a roll-off container enters the picture. If you are a homeowner in Fallston, then you know how much junk can build up during the long cold winter months. Property managers and building owners are also aware of this, but if you are planning a renovation project in the coming months, then you need to clear out your building first. That’s where a roll-off container enters the picture. So what do you need to know about them? Let’s find out together. Many dumpsters that you see in your town or neighborhood are meant to stay there. The municipal authorities are in charge of sending garbage collectors around to empty them into large trucks and then carry all that refuse to the nearest dump or landfill. Roll-off containers on the hand, have wheels mounted on them, making them easier to maneuver. The open top makes it easier to dispose of anything you don’t want cluttering up your Fallston home. Depending on how much you need to get rid of, there are several different sizes of roll-off container. The ones you will see most often are 10-yard, 15-yard, 20-yard, 30-yard, and 40-yard. While many Fallston homeowners will think that they size refers to the length, that’s not necessarily. The size relates to the volume instead. If you plan on cleaning up your garage or lawn, then you may want to choose the smaller sizes, but for more in-depth projects, such as roof repair, roof replacement, or in-home remodeling, the larger sizes may be a better idea instead. What Can You Put In It? What you can and can’t put into your roll-off container is an important question to answer. For instance, you can’t put anything hazardous into the roll-off containers that you rent or buy. It’s also inadvisable to try putting materials such as pesticides, motor oil, electronic equipment, and even batteries. That’s because all of these items can cause damage to the areas where they are processed and further disposed of once the roll-off containers are emptied when they are no longer needed. 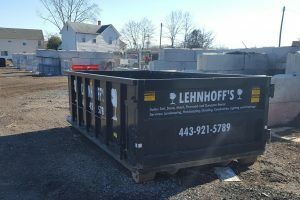 Trust Lehnhoff’s Supply and Design for All Your Roll-Off Container Needs! Lehnhoff’s Landscaping is delighted to introduce Lehnhoff’s Supply and Design. We seek to fulfill all of your landscape supply and landscape design needs no matter what project you’re looking to complete. We are based in Fallston, Maryland and are eager to lend you our expertise and materials. Find us at 2708 Belair Road, Fallston, MD 21047. Call us at 410-510-7646 or drop us a line via email at lehnhoffsupply@gmail.com. Lastly, don’t hesitate to reach out to us on Facebook, Twitter, andGoogle+! We serve but aren’t limited to, the following parts of Maryland: Harford County – Fallston, Forest Hill, Joppa, Edgewood, Bel Air, Churchville, Havre de Grace, Jarrettsville, Street, Aberdeen, Abingdon, and Joppatowne. This entry was posted on Friday, February 8th, 2019 at 2:02 pm. Both comments and pings are currently closed.